The Service Oriented Architecture is an architectural design which consists of various services in a selected network to communicate with each other. Here the complication of each service is not considerable with other service. 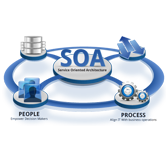 SOA tutorial is prepared for software programmers to know more about the concepts of SOA. This tutorial will provide more understanding on SOA to get to know more about SOA concepts. To learn this tutorial, one must have a basic understanding of client server application model.